In Patanjali’s Yoga Sutras, Ahimsa (nonviolence) is considered the first principle of the spiritual life. 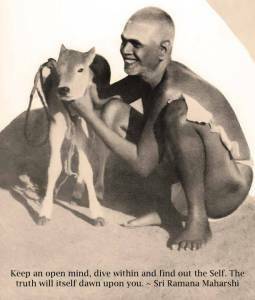 Ramana Maharshi, the great sage of Arunachala has clearly stated, “Ahimsa Param Dharma”. Translated this means that nonviolence is the supreme religion. Perfect Self-Awareness is Ahimsa. Practice of nonviolence with awareness that the same life resides everywhere purifies the mind and allows for the deepest relaxation at the mental, physical, and spiritual level.